The Fuzzrocious Multi Overdrive Tremolo Hex Pedal (M.O.T.H.) is a hybrid of a few things: It’s an overdrive! It’s a fuzz! It’s a tremolo! It’s a noise machine oscillator! An overdrive circuit is set up for low-medium drive. It pushes into a power amp IC which provides a blast of volume. A gain pot provides glitchy, fuzzy tones at counterclockwise and clear, low gain, chimey tones at clockwise. If you start fully clockwise, you?ll hear gain turn to heavier then fuzzy tones as you roll back counterclockwise. 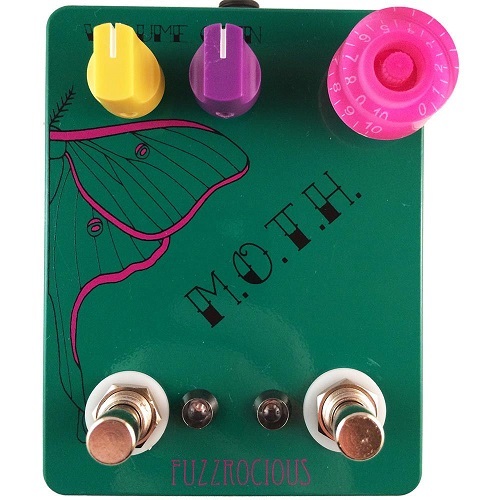 What would a Fuzzrocious product be without some weirdness?! When the left footswitch is activated, the Hex Schmitt Trigger is activated to add that flutter we mentioned. Use the ?H? speed knob to move from a fast tremolo up through pitchy oscillation, all while mixed with your drive signal. For extra fun, turn your instrument?s volume pot off, turn the M.O.T.H. ?s Hex on, turn the Gain pot to fully counterclockwise, and experience something extra weird. You can turn the ?H? speed knob to control how messed up you want to be.